Stem cankers are identified by thickening of the stem. Botryosphaeria stem canker, caused by the fungus Botryosphaeria corticis, is a disease of both highbush and rabbiteye blueberries throughout the Southeastern United States. This disease is usually associated with injuries to the branches, such as those that occur by a freeze or some type of mechanical injury, including injuries caused by string trimmers, mowers or mechanical harvesters. 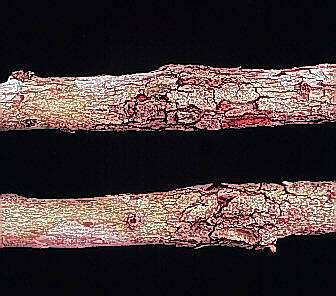 Early symptoms are small red lesions on succulent stems. The lesions become swollen and broadly conical in about six months. On susceptible cultivars, large, swollen cankers develop, with deep cracks and numerous fruiting bodies, after two to three years. Stems may be girdled and killed. The fungus overwinters in infected canes. Current-season stems are infected by ascospores or conidia in late spring. The optimum temperature for growth and sporulation of the fungus is 77 F to 82 F (25 C to 28 C). Eight races of the fungus are known. Control Disease is controlled by planting resistant cultivars; using disease-free planting material; and removing and destroying infected canes. Fungicides, in general, are ineffective. Cline, W.O. and Annemiek Schilder. 2009. Botryosphaeria stem canker. Retrieved 02 March 2010. Milholland, R.D. 1995. Botryosphaeria stem canker. Pages 9-10 in: Compendium of Blueberry and Cranberry Diseases. F.L. Caruso and D.C. Ramsdell, eds. APS Press, St. Paul, MN. 87 pp.